Looking for a brand new 192 DMX512 Controller and a LED Par Light set? It's ideal for DJs, Bands, Bars, Disco, Pubs, Clubs, Family party, etc. The light uses the latest LED technology and counts 18 LEDs (6 red + 6 green + 6 blue). Connecting to DMX-512 signal controllers, it can produce different kinds of color and stroboscopic effects. 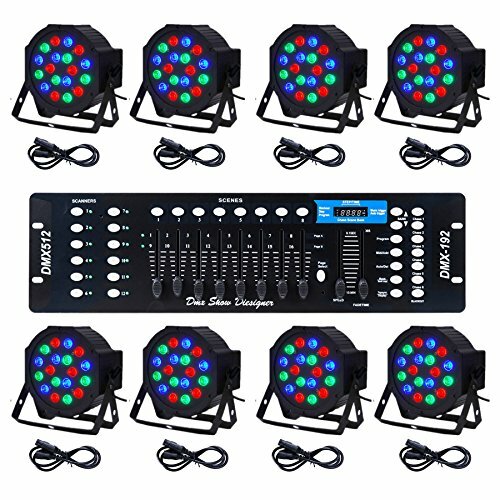 The set of 8 lights and a DMX controller, perfect for DJ sets, disco, parties, dances, stage performances, clubs etc.